You all know them - monsters of D&D lore that look like they shouldn't exist in any sane universe. And I am not talking about aberrations from the Far Realm, but physical creatures that come from the regular material plane, but whose appearance makes no sense. And the usual explanation is: "A wizard did it!" The classical example. Apparently a wizard decided that breeding a bear with an owl would be a good idea. How? Magic. Why? Drug abuse, most likely. So, what other creatures are out there that can top the owlbear? Now, although I love the cocaine wizard Meme, I will make an argument for the owlbear. I mean Owls are, after all, Apex predators. They are swift silent murder machines which are at the top of their niche in the food chain. The problem is they are small borbs, so they aren't much of a threat to humans. Cue combining them with something that's bigger and more dangerous that IS a threat to humans. Now me, I would have gone with a great cat, like a puma or lion to fuse with an Owl, instead of a slow clumsy bear, but what do I know? My natural take is that they're all bird, having evolved back to a fully quadrupedal stance. Or it's a full on quadruped bird. The "fur" is actually pycnofibers or maybe filoplumes. I know the chimera has a peerless peleponnesian pedigree, but there's no way such a thing isn't the result of cocaine wizards doing their thing. The goat-lion-dragon of D&D is pretty weird, but it's actually taken its side-by-side head arrangement from Cerberus. The mythical chimera had the lion head at the front, the goat head sticking out of the back, and its tail was a serpent. I couldn't say which is the prototype and which the final product! Cerberus-style has difficulty fitting through doors, but classical-style has a goat's head sticking out of its spine and I just don't know what it thinks it's going to do with it. Both of them are dumb, dumb bodyplans. I suspect the creature has its origin in the riddle where you are on one side of a river with a wolf, a goat, and a sack of cabbages. But someone made the mistake of asking a wizard for the answer, and she started giggling and didn't stop until this thing was ravaging the countryside. The worst thing is that, with cerberan and classical varieties, someone actually thought the design was worth copying. Neo-otyugh. There's no way those weren't made by a wizard looking for the perfect garbage disposal. Probably the same guy who invented the sphere of annihilation and then undoubtedly died of it. 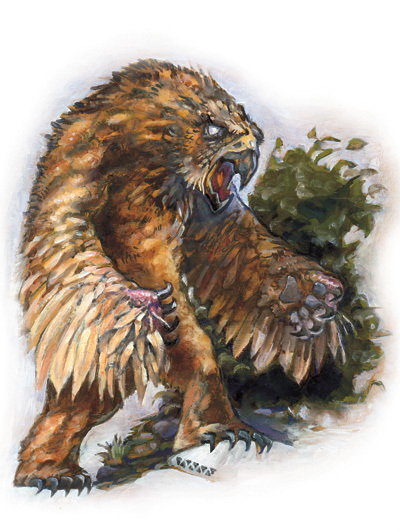 There’s no reason for an owlbear to be exceptional in a world which contains griffons and hydras as ordinary wildlife. Also, they’re not hybrids of bears and owls. They’re hybrids of bears and giant owls. Important difference. 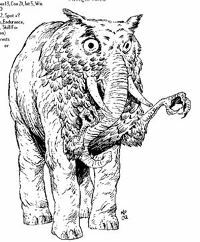 Another backer for the owlbear as what a fantasy world should naturally contain if it isn't operating under a rule like "no monsters that can't be found in a real-world mythology book", but to keep in the spirit of the thread, I nominate the original flail snail. A seeming hybrid of two animals, as the platypus demonstrates, doesn't have to be any different from a griffon. But the original flail snail looks like the hybrid of an animal and a crafted tool, which is a lot trickier to explain. (My wife says "More like an LSD wizard.") However, recent art of the flail snail does a lot to make the flails look less like human weapons and more like natural thagomizers, which I kind of love. Again, kind of great that they lean into the world being more fantastic and not the jerks in robes. I frequently run the mimic as the creation of wizards, but it's less about cocaine and more how you build traps to protect your stuff if you're good at life magic but crappy at tinkering and it's always such a bother to find new trapsmiths after you've killed the previous ones to make sure nobody but you knows the interior layout of your tower. The Hellhound is just a creation of late-career cocaine wizard after he had to sell the tower and live in a bait shack by the river.